It’s important to have a separate space designated for studying in order to reduce distractions, especially for getting back into the school routine this fall. 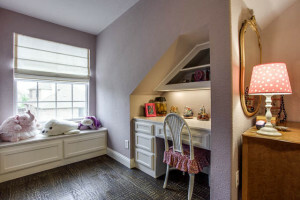 In order to help you or your children remain focused for an extended amount of time, your study space should also be comfortable and clear of clutter. As you are maintaining the cleanliness of your space, have fun making the space your own. If you are working in a boring space, you may become bored with your work quickly and will be unable to get much completed. You can be more productive when you feel relaxed and comfortable. These are just a few reasons why you should use some creativity when making a space for studying. With the following ideas, you can make your study space both inspiring and stimulating. You can use the walls in your study space in a very creative way. You can cover them with inspiring artwork, family creations, or use one full wall to create an oversized bookshelf. Choose books that are related to current studies or family interests. There can also be a few books thrown in that are just purely fun to read. This is the piece of furniture that will be used the most when studying or doing homework, so the placement of the desk is very important. It should be in a space where you feel good sitting for hours at a time. Many people like to place the desk near a window that faces a quiet outdoor area, or a serene view of nature. When you are in need of a break from your work having a scenic view is a great way to quickly rejuvenate. Use small items on your desk that help to keep you relaxed. You can use an area rug in the room to produce a space with vibrant colors, or a warm texture, that can be changed whenever the mood strikes you. It is good to consider rearranging small things within your space in order to keep the energy of the room vibrant and interesting. These are just a few ideas that can help you create the perfect creative space for homework, studying, or a peaceful place to read. You only need to make a few adjustments to your space to keep it looking and feeling fresh and new. You and your family will be able to achieve so much more when your study space is one in which you are comfortable and inspired. Do you need to refresh your space? Whether it needs new flooring, a fresh coat of paint or a complete gut job, we have the services you need. Contact us at 972-377-7600 or click here to request an estimate.